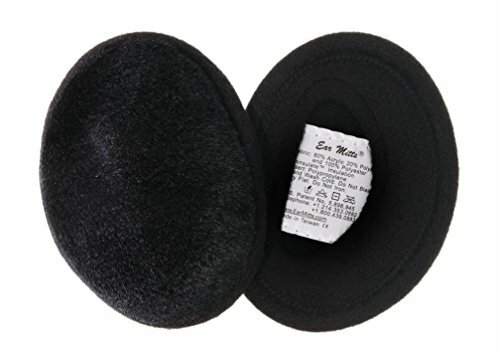 Ear Mitts Bandless Ear Muffs, Black Mink Faux Fur Ear Warmers, Regular | What Should I Say? Ear Mitts® are designed to fit securely on your ears, keeping them protected from the wind and cold. Three layers - soft and durable faux fur (combed to prevent shedding), 100 gram ThinsulateTM Insulation from 3M, and a fleece inner lining - keep warmth in and the wind and cold air out. A patented flexible polypropylene frame adjusts to your ears and becomes more comfortable the more you wear them. A stylish alternative to traditional scarves and band ear muffs, Ear Mitts® provide warmth and comfort without interfering with your hairstyle! They also fit comfortably under helmets, caps, stocking hats, hard hats - any headgear! Comes in two sizes- standard and small. The design also permits unrestricted hearing during use. Compact enough to fit in a pocket, fanny pack, or hand bag. For care, hand-wash and dry flat, no bleach, no iron. Available in fleece, denim, faux fur, faux leather, faux suede, velvet, sparkle, and embellished with Swarovski Crystals - See our other products on Amazon! Slip-on bandless Ear Mitts® fit comfortably and securely while preserving your hairstyle. Can be worn under any headgear and over earbuds! If you have any questions about this product by Ear Mitts, contact us by completing and submitting the form below. If you are looking for a specif part number, please include it with your message.